So we knew this would happen eventually…. due to our complete lack of technical know-how, we made our first big mistake. 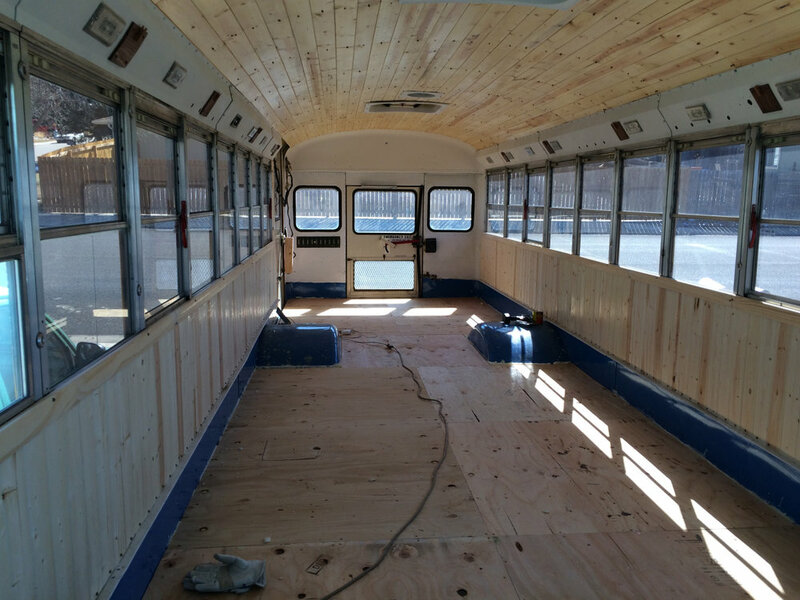 We made a lot of progress on the bus this week. We put the pedal to the metal because we are desperately wanting to get the title changed over to a “motorhome” so that we can have insurance and drive Savannah legally. It was time to install the subfloor! We were excited to check this box off of our massive to-do list so we did a little bit of research and we rushed to Home Depot. First we installed the furring strips along the edge of the floor. We decided that we wanted the extra security of screwing them into the metal floor which hurt since we had just spent so much time patching holes. In addition to screws, we used liquid nails as well as a touch of silicone in each new hole, hoping it would dry and seal up the new holes nicely. We also plan to hit the ones we can reach from under the bus with some silicone. Next, we put horizontal furring strips about every 2 feet. This was our little mistake. We realized later that it would have been smarter to space them in a way that we could lay down the standard 4×8 ft material and have each board end on a strip. Oh well. So we first had the particle board cut in half at Home Depot so that it would fit in our trooper, then we got it home and had to make 2 cuts on each piece which wasted time and materials. Oops. We framed the hole in the floor that is for accessing the fuel level sending unit. We wanted to keep it accessible because apparently, if a mechanic has to “drop the tank”, it can become very expensive. This is something I think we did right! Then, we cut our rigid foam to fit the spaces in the floor for some insulation and sound-deadening. PS: finding 3/4″ foam was harder than we expected! Just something to keep in mind if you’re looking to insulate your floors. You may want to consider a more common thickness and get wood strips that match that measurement. Finally, we spent the whole weekend screwing down the particle board subfloor. We were so proud. It looked good and it was just nice to not be staring at the blue painted metal for a change! It felt strong, solid, uniform . . .we were pretty happy with it! Fast forward 5 days… We kept having people ask us (very politely, I’ll add) why we chose particle board. “Why not?”, we thought. It said right there on the home depot label, “use for subfloor”. It was inexpensive. It felt strong. It wasn’t going to give us splinters. We called an audible in the store and hadn’t looked back. When we finally decided to perform a 30 second search on Google, it became immediately apparent that we had chosen poooooorly. Particle board is like a sponge to water, is brittle, heavy (that part we knew), and doesn’t hold on to nails. After being bummed for about a day, we decided it was worth it to replace it. We were lucky to have people help us figure this out before we got further into the build! We went back to the store and chose plywood (after actually researching plywood vs. OSB for subfloor!). It took us 1 day to rip out the old stuff and install the new since we had some great templates already created. And silver lining: we told an employee our story and ended up getting $100 off our plywood !! !